Fire Door & Frame Repair plus Installation – Fire Door Installation Richmond Hill, Ontario. As most people know, safety and property protection are critical these days. That’s why Fire Door Installation Richmond Hill offers repair as well as installation of fire-rated doors and frames to clients across Ontario. Our skilled technicians are trained to properly fix and add fire doors so that people in your building can exit safely while limiting the spread of smoke and fire. I’m sure you know that when lives and property are at risk, the fire rated doors and frames used in your building must meet high standards. That’s why the our doors and frames have been tested in accordance with UL10B, UL10C and UBC 7-2. They are listed by Underwriters Laboratories and Warnock Hersey, and available with the labels usually required for your building to be up to code. This means that what we install not only meets building needs, but that you get peace of mind from knowing that you’re creating a safer work environment. The management team of Fire Door Installation Richmond Hill Repair has been installation and fixing doors for over 15 years. What this means to you is that not only do we have the experience that you deserve, but the knowledge needed to determine what your fire door needs are. We offer various fire doors with labels ranging from 20 minutes up to three hours. Steel fire doors are rated by the amount of time that the door can withstand exposure to fire while being tested. We are able to provide you with the correct fire doors at the required ratings needed. We’re proud to carry fire doors rated up to three hours for the best protection possible of your building and employees. Please call us now at (647) 866-0956 for a free quote on our repair services, or for more info. You may also complete the easy service request form at right for a free quote on our services. Here’s the technical stuff for those that need specs: Call (647) 866-0956 Now for Expert Service. Standard frames as well as drywall frames have been tested in accordance with UL10B, UL10C and UBC 7-2 and listed by Underwriters Laboratories (UL) and Warnock Hersey (WH). They are available with labels from 20 minutes to three hours. Three sided labeled frames can be furnished K.D. (knocked down) or set up (welded) with various loose (“T” Masonry, wire masonry, existing wall or UNA twist in stud) anchors. Stock frames come with embossed UL label on each hinge jamb. Labeled frame assemblies for use as borrowed lights (windows). Transform / side panels and transform / side lights are available in a variety of configurations and must be of welded construction. Glass for assemblies can be wire glass or laminated or solid ceramic glazing. 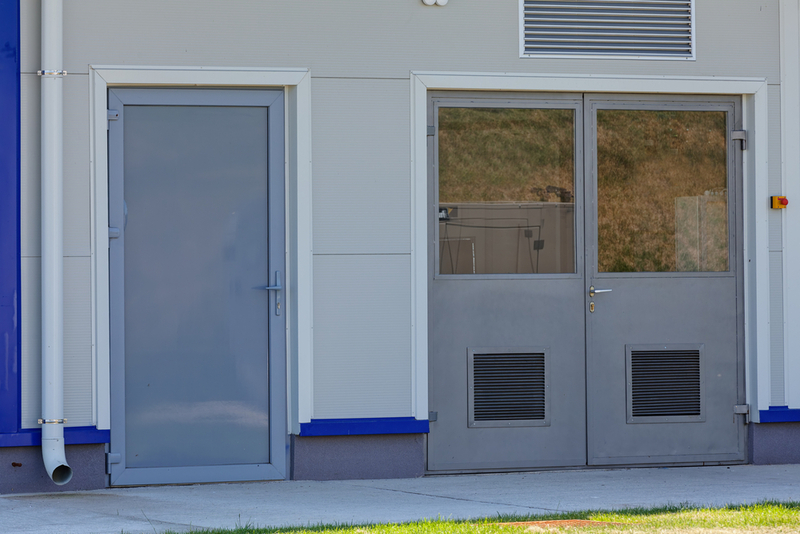 Fire rated doors have been tested in accordance with UL10B, UL10C and UBC 7-2 and listed by Underwriters Laboratories (UL) and Warnock Hersey (WH). They are available with labels from twenty minutes to three hours. The size of the glass lites is dictated by the required hourly rating. All glass used in fire rated doors must be listed glass and be either 1/4″ [6mm] wire, laminated or solid ceramic material. 3 Hour – 100 sq. inch [.065m2] per door leaf (where permitted by the authority having jurisdiction) special glazing. 45 Min – 1296 sq. inch [0.84m2] per light neither dimension exceeding 54 inch [132mm] (2856 sq. inch [1.84 m2] with special glazing). 20 Min – without hose stream. 2971 sq. inch [1.93m2] per light (width 35 3/4″ [908mm] x height 83 1/2″ [2111mm]). Fire rated doors can be prepared for listed fusible link louvers. Maximum louver 24″ x 24″ [610mm x 610mm], maximum rating 1 1/2 hours. Doors with louvers shall not be provided with glass lights, vision panels or fire exit hardware.